Emmanuel Levinas was a major philosopher of the 20th century who attempted to proceed philosophically beyond phenomenology and ontology and to engage in a more immediate and irreducible consideration of the nature and meaning of other persons. A strongly religious person, Levinas also wrote extensively on Jewish themes. 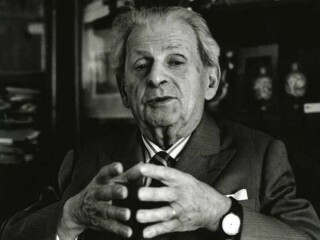 Emmanuel Levinas was born in Kaunas, Lithuania, in January 1906, into a traditional Jewish family. He did his elementary and secondary studies in Jewish and secular subjects first in Lithuania and then, later, in Russia. At the age of 18 he went west to study at the University of Strasbourg, where he majored in philosophy both at the undergraduate and graduate levels. In 1928 he moved to the University of Freiburg to study with the great philosopher Edmund Husserl, the father of the so-called phenomenological school in modern philosophy. In Freiburg he also encountered, for the first time, Martin Heidegger and was deeply influenced by his classic 1927 work Sein und Zeit (Being and Time) (1962). In 1930 he received his doctorate for a thesis on the Theorie de l'intuition dans la phenomenologie de Husserl (The Theory of Intuition in Husserls' Phenomenology) (1973). He became a naturalized French citizen in 1930 and subsequently professor of philosophy and director of the Ecole Normale Orientale of the Alliance Israelite Universelle in Paris. In 1964 he assumed a professorship in philosophy at the University of Poitiers, and later, in 1967, at the University of Paris at Nanterre, moving finally to a professorial appointment at the Sorbonne in 1973. He retired in 1979, but continued writing books, some of which sold over 200,000 copies. Levinas' work is best understood as an attempt to proceed philosophically beyond the views of Husserl and Heidegger, concerned as they were with phenomenology and ontology, respectively, and to engage in a more immediate and basic consideration of the nature and meaning of other persons. Such a focus reveals the Other—that is, the other person—as existing in his or her own right—that is, not subject without remainder to incorporation within the conceptual world of the subject-knower, nor, again, something whose essence can be captured by thought. Once the nature of this otherness is grasped, once the Other is appreciated as beyond the totality of ones' organization of the world as knowledge, as what Levinas called "non-synthesizable," the Other can be rightly understood as a window, an access, through which to intuit the Infinite. In this connection, Levinas emphasized aspects of experience which he took to be beyond totality (conceptualization) yet, at the same time, which give access to the Infinite. Among the salient items which he called to attention in this context are, for example, the philosophical significance of the Human Face, the mystery of human speech, the centrality of ethics, and the particularity of each human being's relation to God. Each of these elements in human experience defies categorization and systematization. Each is rooted in an act of intersubjectivity which recognizes the privileged position of the Other. Moreover, Levinas insisted, contra both Husserl and even more especially Heidegger, that this fundamental intersubjectivity is essentially ethical in character. In doing so he inverted the relationship between ontology and ethics and made ethics primary. Levinas referred to this ethically charged intersubjectivity as characterized by responsibility for the Other. The Other, by his or her nature, makes an ethical demand upon oneself, and the self in response can only be the fully human personality that it is by assuming the moral responsibility demanded of it. Even when the Other does not respond at all, or responds unethically, the self is bound by its own moral imperatives, emerging from its own compelling subjectivity, to act with moral correctness. It is this demand and the behavior predicated upon it that makes one human. And it is in just this ethical modality that we glimpse the Infinite within our finite existence. In ethical action we testify to the Infinite, and such testimony, in effect, brings into being a dialogue of man and Spirit, a dialogue in which the human testimony interiorizes and makes its own the previously exterior and distant "voice" of God. His work was influential even amongst Christians— Pope John Paul II often praised and quoted his writings. This latter concern, this concentration upon man's establishing a partnership with the Ultimate, reflects Levinas' preoccupation with traditional religious and especially Jewish categories. An observant and learned Jew, Levinas saw his philosophical work as consistent with his religious heritage, though not necessarily in the medieval harmonistic sense. Thus, in addition to technical works on the cutting edge of contemporary philosophy, he also wrote numerous papers and monographs on Jewish themes, especially as they are found, analyzed, and classified in the Talmud (rabbinic sources). Levinas died of heart failure on December 25th, 1995, in Paris. Levinas wrote a series of important books in French, a number of which have been translated into English. His main philosophical works are The Theory of Intuition in Husserl's Phenomenology (English translation, 1973); Existence and Existents (English translation, The Hague, 1978); En decouvrant l'existence avec Husserl et Heidegger (Paris, 1974); Totality and Infinity (English translation, 1969); Difficile Liberte (Paris, 1963); Quatre lectures Talmudique (Paris, 1968); Otherwise than Being or Beyond Essence (English translation, The Hague, 1981); Ethics and Infinity (English translation, 1985); Collected Philsophical Papers (English translation by A. Lingis, The Hague, 1987); The Levinas Reader (edited and translated by Sean Hand, Oxford, 1989); and Emmanual Levinas: Basic Philosophical Writings (edited and translated by A. Peperzak, S. Crichley, and S. Bernasconi, Bloomington, 1996). View the full website biography of Emmanuel Levinas.